Here’s something I sometimes struggle with as a health and fitness coach: does the approach of having programs designed for a short period of time (like 21 days or 60 days) help people focus? Or does it contribute to the yo-yo phenomenon of people doing a program but then going back to their old ways? Essentially, do short-term programs work at developing a healthy lifestyle? Personally, my healthy lifestyle has a balance. I’m always doing a fitness program and I eat about 80% super healthy and 20% fun. And, I track my eating for one week every month just to make sure I haven’t gone too far off track. But every now and then I do something I call a focused round of a program. That’s when I dial-in my nutrition so that I’m eating 100% on-plan while I’m doing the program. To me, that helps keep me in balance. I still get to enjoy the finer things in life (like ice cream! ); just not during these focused periods. The notion that a person could be 100% on plan, all the time, forever, is foolish. It’s very important though to plan this idea out! You can’t just say “I’m going to focus starting tomorrow!” without considering that might be happening in your life a week from now. Here are three things I recommend you do to improve your chances of having success at a focus period. Look at your schedule first. Are you going on a trip? Have a party or celebration to attend? Anything else that might lead you into temptation? I look for places in my schedule where I have those 3-6 week blocks where I won’t have any issues staying on track. Put all of your workouts in your calendar. Block that time off and make a commitment to yourself that you are going to show up for every workout in the program. Create your weekly eating plan and grocery list well in advance. The programs that I offer all have nutrition plans that are easy to follow. And I give my clients tools for planning and tracking. So plan out every meal and snack for the entire focus period. How often you do a period of focus really depends on your goals and your starting point. 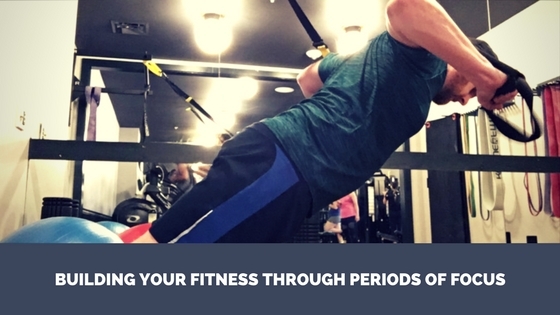 If you’re already at an ideal weight or fitness level, then doing a focus period once or twice a year will probably do the trick. If you’re just starting out, you may want to be in a focus period 80% of the time. For example: do a 21 day focus period, take a few days off, and then get back into it. By doing these focus periods, you will move closer to your goals, while maintaining balance in your life. Need help with a focus period? Reach out to me! I’m here to help.